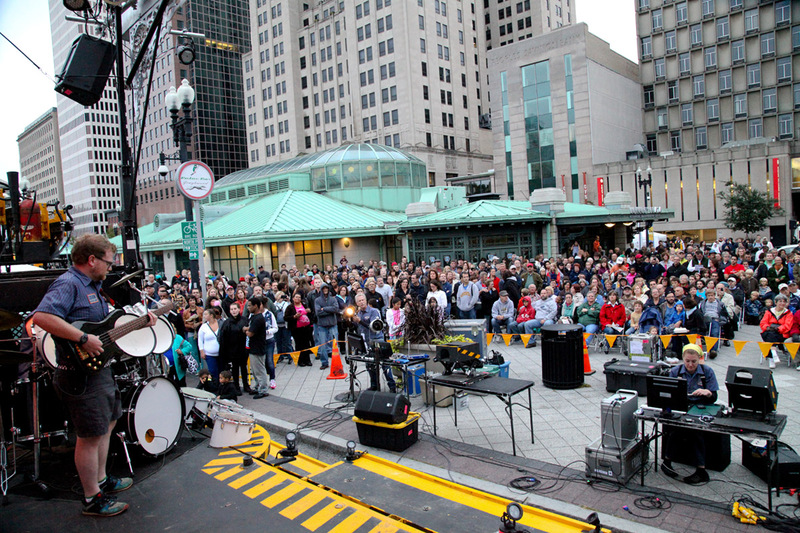 October 2012 FirstWorks Festival in Kennedy Plaza, Photo: Providence Department of Arts, Culture, + Tourism. Providence, RI – Mayor Jorge O. Elorza and FirstWorks are pleased to announce the Providence International Arts Festival taking place June 11th – 14th, 2015. Building off of Providence’s international recognition as a creative city, this first-ever signature event will be a jaw-dropping celebration featuring world-class arts, sculpture, music, food and spectacle in the heart of the city’s downtown. The centerpiece of Festival activities is Saturday, June 13, 2015 with events beginning on Kennedy Plaza at 4pm. The Providence International Arts Festival will literally transform the city with international artists in visual art, sculpture, music, public art, civic dialogue, educational workshops, community play, spectacle and parade. The Festival will be centralized around program hubs that unify the downtown into an arts corridor – PVD City Hall, FirstWorks on the Plaza, Public Art Transformations, Empire Street Gateway, and the Washington Street Corridor. Opening ceremonies will feature a specially commissioned first work, One Voice by Dr. Clarice LaVerne Thompson with RPM Voices of Rhode Island and a stunning 800 voices in a procession to City Hall from all points of the compass to kick-off the festivities at 6pm on Saturday, June 13, 2015. “This festival will be a spectacular convergence of art and music, transformation and ideas – tying the hyper local extraordinary talent with internationally renowned artists and gems on the global arena to spark the imagination and streets of Providence and beyond,” stated Kathleen Pletcher, Executive Artistic Director of FirstWorks, Festival co-producer and a Providence-based nonprofit organization that brings world-class performing and visual artists and unique “firsts” to Rhode Island. The Festival is funded with lead support from an Our Town grant from the National Endowment for the Arts, GTECH, and the RI Foundation. Additional support is gratefully acknowledged from Alex & Ani, Coastway Bank, Narragansett Beer, Textron, University Orthopedics, and the Providence Tourism Council. Two RFP’s have been announced to catalyze local participation: one for performances on the Community Stages on Washington Street and Burnside Park and a second for public art interventions/installations. Providence’s Department of Art, Culture + Tourism, along with FirstWorks have convened local organizations to collaborate on festival concepts and planning since December 2013. Community members, vendors and performers wishing to participate can visit PVDFestival.com to learn more. A full schedule of artists and happenings will be released in early May 2015.